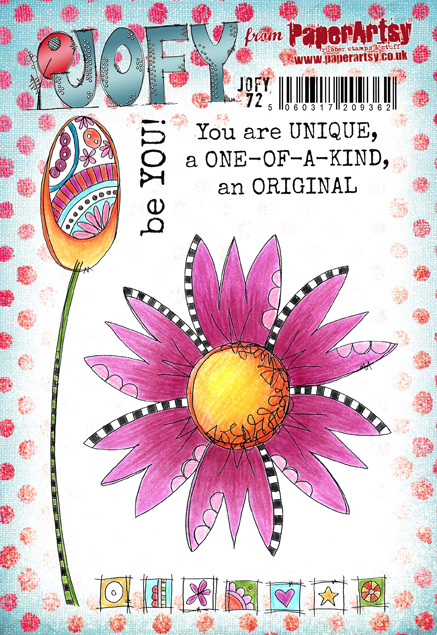 Jo is our most experienced product designer here at PaperArtsy. She now has almost 80 stamps sets and well over 60 minis, plus all her stencils in 3 sizes. For several years, her beautiful designs have brought our customers so much enjoyment, be it from her Christmas Santas and snowmen to the stunning floral offerings in her easily recognisable hand-drawn style. If only I had a dollar for every time someone has wished they had Jo's handwriting, or asked if her handwriting was a font! It's so nice that with the passing of time, her stamps remain relevant, as everything new fits in with everything old (one reason why we never discontinue stamps here; the expansion of any designer collection offers the end user continuity and versatility). For Jo's January release in 2019, she carries on with 3 more beautiful large blooms like the image above. 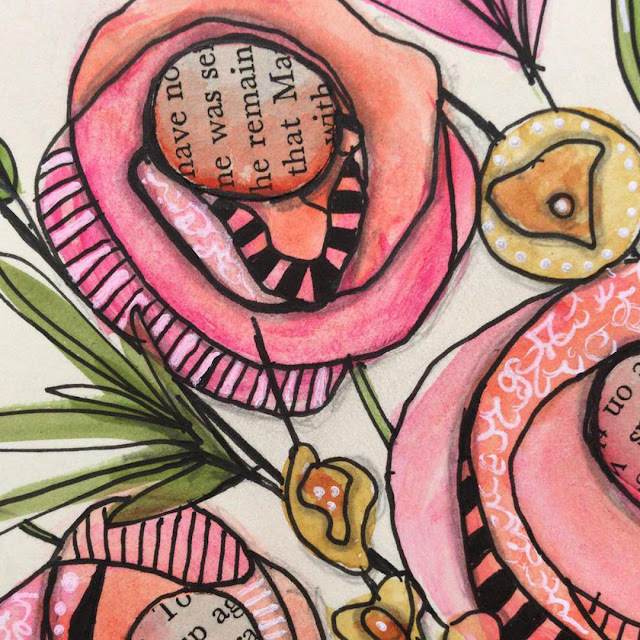 You can always clearly see Jo's iconic style in her designs, but she is heading off on a slightly different floral tangent for her March 2019 release, there are bolder elements within these blooms (stripes, checkerboard) as well as her beloved bookscript - which if you follow her blog, or have taken a class with Jo, you will know plays a role in pretty much every class she teaches! If you were following Jo on Instagram, you will have seen a taste of what is to come in March - she always doodles when on her summer holiday, and those designs often follow through into her ensuing stamp releases! This announcement is the first of 2 releases, you will see more from Jo in March, but if you are a retailer attending trade shows, you will get to be hands on with these products as the forthcoming shows in January and February. I'm even more excited than usual to share this new release with you! I have designed 3 new stamp set and 3 coordinating stencils. These designs differ from previous releases because of their size - these are large flowers!! 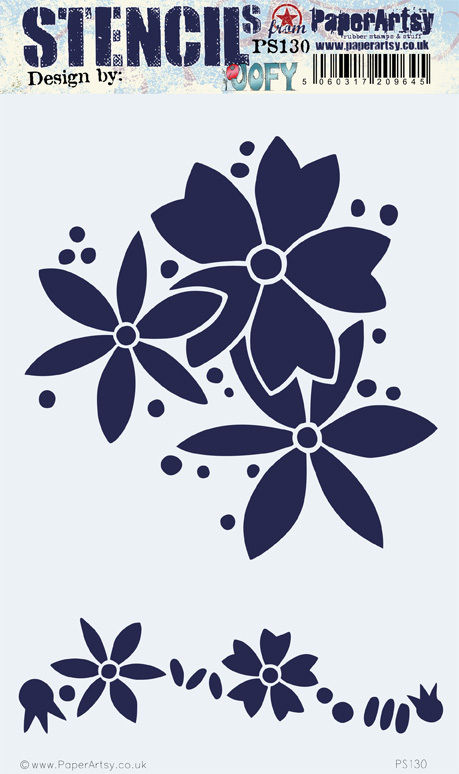 I wanted bigger, bolder flowers to use alongside previous releases. 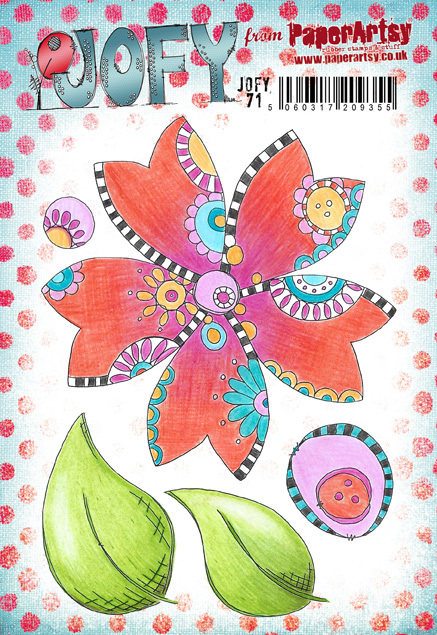 Enlarging the size means they are going to look fabulous on art journal spreads and home decor pieces!! Don't worry, they may be big but there is still lots of nice detail to play around with.... and some extra space for you to add your own doodles should you want to! Over the next few days, we will be sharing ideas with my newest products by myself and 2 of PaperArtsy's lovely talented bloggers. You can also see ideas on Instagram, Facebook, Twitter, Pinterest. So no matter what your preferred social media platform, we will be sharing with you! The flowers in these new stamps sets are large - approximately 11-13cm wide but they are still suitable for cards - the card above is a standard size 10x15cm - the flower looks great cut off at the edges and embellished with a die cut leaf stem. As much as I reeeeeally like the flower on this stamp set I think I like the little border blocks more! lol I've used them on the card above and painted some of the detail. When I designed them I kept visualising them stamped in white on a painted background which is what I've done on the sample panel for stencil PS130 later in this blog post. The flowers make a lovely centre piece on a greeting card - this card is approximately 15cm (5 3/4in). I love how big and bold they are! I hope this reassures the card makers among you that these bigger flowers can be used on cards as well as art journal pages and home decor pieces. White on green is such a calming colour combination isn't it?! This is a panel but would look great as an art journal spread too! On this panel you can also see the little white blocks I mentioned earlier (from JOFY72). 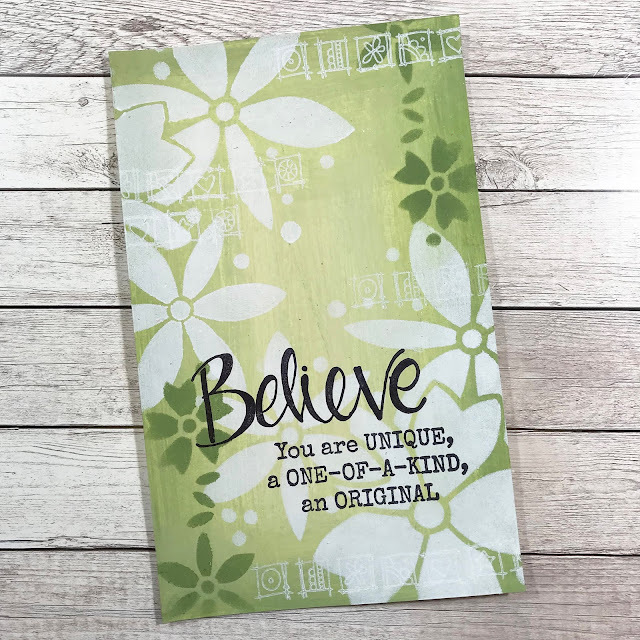 This panel also shows how stamps from different releases can be combined - 'believe' is from JOFY68 (a christmas set) and the sentiment is from JOFY72, part of this release. 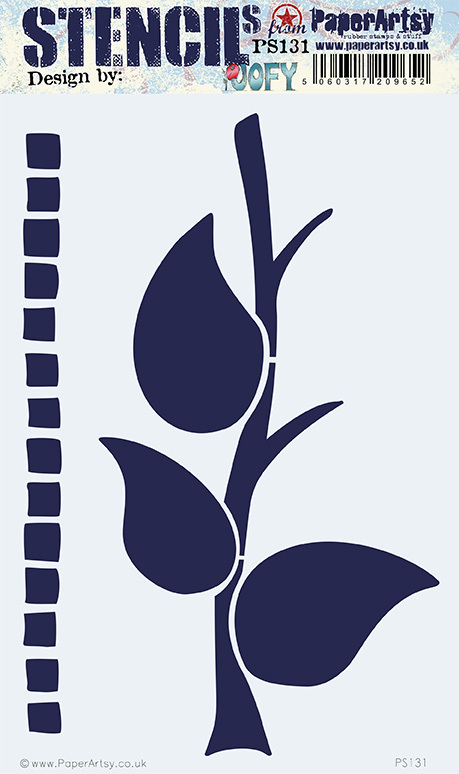 While on holiday I sketched a lovely big stem with big flowers and this is the resulting stencil. The leaves match with those on JOFY71, and the squares running down the side of the stencil match up with the little doodle blocks on JOFY72. When you buy this, you will receive the leaf-shapes to use as masks too as part of the stencil. In the photo below you can see how the stamped leaves fit perfectly on the stencilled stem. I think this is going to be a really versatile stencil. 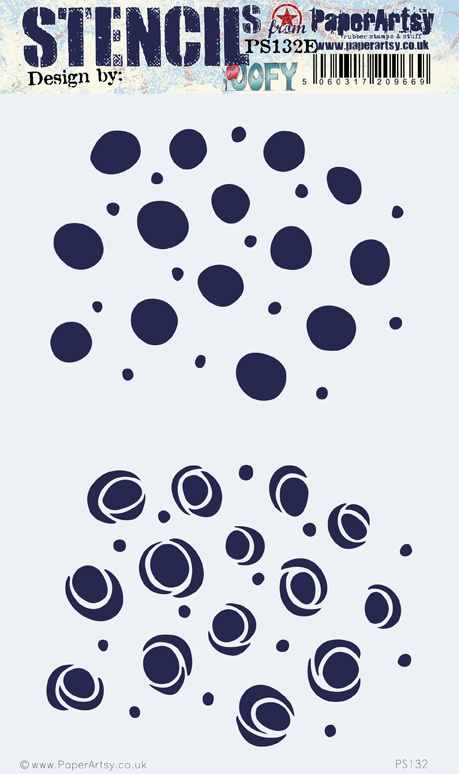 I wanted to design a kind of 'mix and match' stencil. Four variations (at least!) can be made using the two parts. The spots (top) and swirls (bottom) look really nice used on their own, but when stenciled in a different order they look quite different as illustrated in the photos below. The patterns are quite different but they are really easy to match up to create that slightly off-set look. Choose your first stencil & apply colour. Remove the stencil, dry the paint. Lay the second stencil on top of the created pattern, match up the small spots and add your second colour. 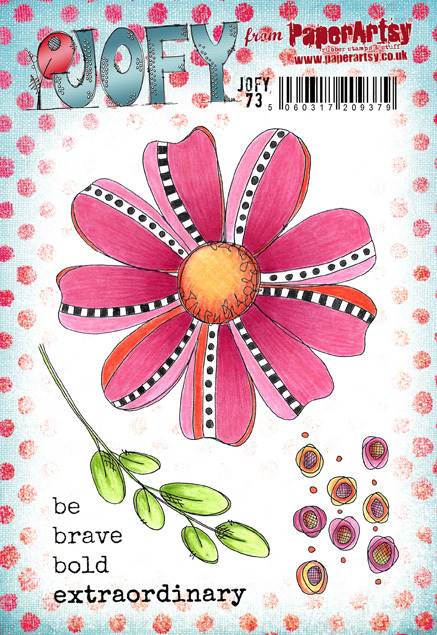 Intro: This design can be created as a card or an art journal page/s by adding or removing the number of flowers used. 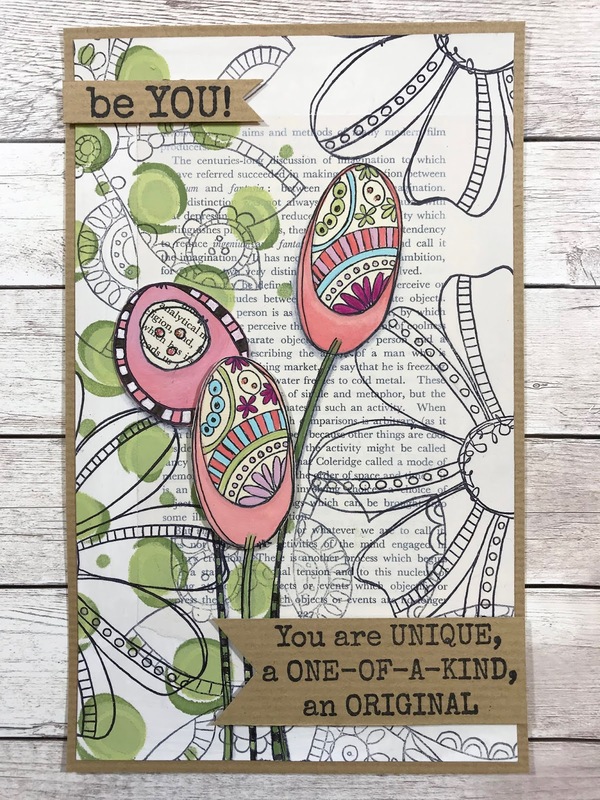 This panel measures13x21cm (5x81/4 in), it is made from card but it could be created on an art journal page or a canvas board. First I glued a book page to a piece of Heavy Smoothy and when dry painted over the surface with Chalk Fresco Finish. I added two layers of stenciling using PS130 - I think these spots are going to be a bit of a favourite of mine! I wanted to include several of the large flowers in the design but not make them the main feature so I simply stamped them in Archival black ink. When I stamped the next design of flower I used the second generation print to create a bit of depth and differentiate between the designs. I stamped the doodle bud design onto the panel twice and a third time but without the bud head. I did this so I could add a different flower to the stem. I stamped the flowers onto vintage book pages and painted them with Fresco Paints. And finally I assembled/adhered all the pieces, and added two panels with words (JOFY72). To finish it off I mounted it onto a panel of kraft card. I mentioned at the start of this blog post that I designed these larger stamps journaling and home decor projects in mind... but how about accessories!! I recently searched for a 'pleather' handbag with the intention of decorating it with stamping - I found an ideal one with plain panels, a straight shape and flat surface all of which made it perfect for stamping onto. The process was a little bit tricky but it was worth it! First I packed the bag with flat wood blocks so I had something firm to stamp onto - these were soon swapped out for big hardback books which proved much more stable and more suited to the task. I stamped (using Archival ink) the largest of the motifs first so the other motifs had something to fit around - I didn't really want the motifs to overlap - I had originally planned to doodle around the images but found I like the clean lines of the stamps so left them unaltered. The stamping was fairly straightforward - making sure the surface was flat and supported from inside the bag was the most important. I chose circular and simple leaf designs from previously released stamp sets (JOFY53 & JOFY54) and they sit really nicely alongside the new large flower. These stamps are going to be a lot of fun - my head is spinning (gently!) with all the ideas of ways to use them. As always I look forward to seeing what everyone creates with them. 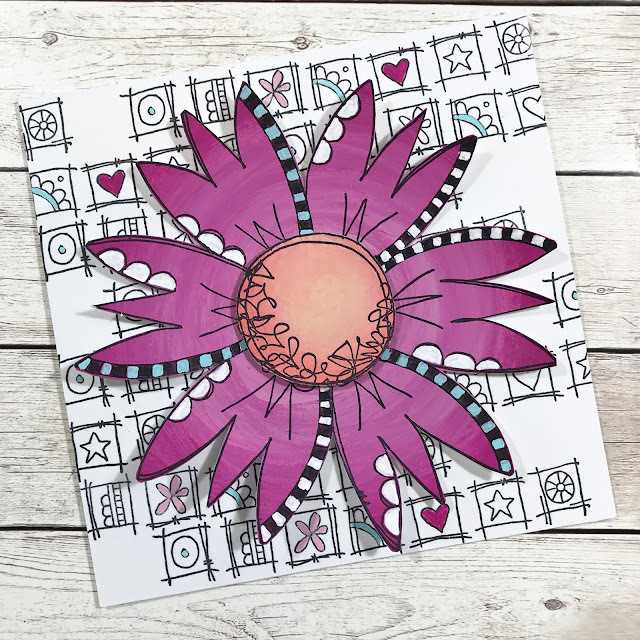 Fabulous additions to your family of stamps and stencils Jo. Can see that the spots will be contagious! Boom boom! Absolutely love them! JoFY strikes again! 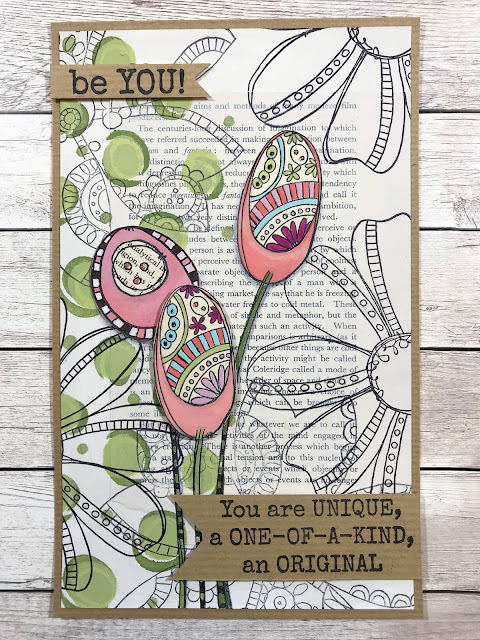 Gorgeous stamps and stencils Jo - I love your projects too - that bag idea is awesome! these are the bomb Jo!! I really love those big blooms! great idea!!! Fabulous giant blooms, but no surprise that I'm most in love with the leafy greens - the gorgeous card with the white flowers on that subtle background and especially the wonderful sample you shared the step-outs for... lovely book page and all. That stencil is such a great abstract element in a background - great design. Stunning creations and love the new products and I do so love Jo's style too x.
Swoon! I am completely in love with these.... congratulations!